Heinz UK is running “I Love Winter”, an advertising campaign reminding people of the comforting warmth a bowl of Heinz Classics Soup can bring as the weather becomes more wintery. The TV advert features a woman who arrives home soaked to the skin by the worst of the British winter. Her attempts to warm up with a bath, a blow dryer and layers of warm clothes are capped with a steaming bowl of Heinz Cream of Tomato Soup. 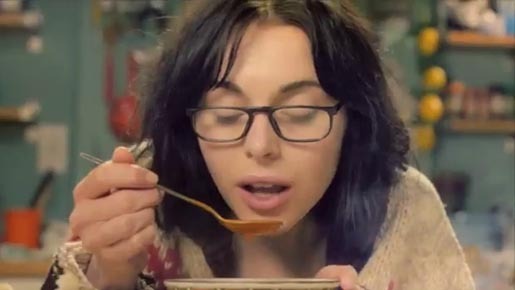 The ‘I Love Winter’ TV campaign is supported by a radio advertising campaign featuring celebrity voiceovers such as Tom Baker and Caroline Quentin reflecting on their experiences of Heinz Soup. Going live in late October, the radio adverts will be tuned to the weather conditions, and up weighted when the temperatures drop. The I Love Winter campaign was developed at AMV BBDO, London, by copywriter Richard McGrann, art director Andy Clough, agency planners Sophie Lewis, Peter Zezulka, account team Richard Arscott, Sam LeCoeur, Nick Lee, Katie Gray, and agency producers Yvonne Clayton and Zoe Cunningham. Media was planned at Vizeum by media planner Louise Roberts. Filming was shot by director Jeff Labbe via Sonny London with producer Amy Appleton-Smith. Post production was done at Absolute Post and The Mill. Audio post production was done at Wave Studios.